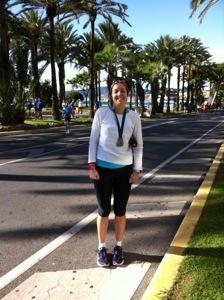 A nice day for running in Nice! As I sit in a bustling roadside cafe in the trendy district of St Germain des Pres in Paris with my parents watching chic Parisiens smoking their endless cigarettes in the chill of French November evening I’m able to reflect on what I felt for me was a disappointing marathon last Sunday. Having arrived in Nice on Friday evening to warm sunshine and a beautiful clear blue skied day on Saturday all felt good for Sunday. I felt strong and confidant especially after all the rehab and strength work I have done with my endlessly patient trainer Luke Worthington….but the thing to remember is that long distance races often have different plans for those running them. My father constantly checking the weather reports informed me with some trepidation that it was forecast to be quite windy on the Sunday. So when I got up and had my breakfast in the top floor restaurant of the hotel (although sneakily eating mainly my own food from previously learnt disasters), there didn’t appear to be a breath of wind. I headed off to the start in good spirits, vaselined up in necessary areas, energy gels and snacks in my running belt, sunglasses at the ready, number pinned on correctly. The sky was slightly cloudy and overcast but cool and more importantly only a gentle breeze, and NOT windy! And so at 8am the gun fired (or at least there was a loud hooter – it may not actually have been a gun) and the Nice to Cannes Marathon was underway. As the day brightened I felt pretty good, it is hard not to when running alongside the Côte d’Azur sea in all its startling blueness. The miles/kilometres seemed to be sliding away quite comfortably and I was feeling pretty good, so much so that I began to start working out more accurately what time I might finish and figured I was heading for about a 3.40 time, faster if I could pick up some speed in the closing miles… However, this was not to be! At about kilometer 28 a pain started running up my left thigh, and not the sort of muscle ache you get as you realise you are hitting the wall in a marathon, or a pulled muscle either but simply acute cramp. Pure agony. I stumbled to a halt and stretched my leg and rubbed it with some energetic vigour cursing loudly. Tried to get going again, but too soon and was reduced to walking/stumbling along for about a mile all the while thinking, it’s ok, it’s ok I can still pick up for the last 10kms. With the beautiful stretch through Antibes behind us where the sun had broken through the clouds and now there was only blue skies above us all looked promising if I could only ease my leg. And as the pain began to subside, approaching kilometre 30/31 the race goes round a big headland and all of a sudden a horrifically strong headwind all but knocked all runners off their feet. We were literally bent double against it, and all reduced to what reminded me of the desert shuffle when running across the Sahara! The wind was simply relentless, blowing either right into our faces or blasting across us from left to right bringing with it salty spray thrown straight at our faces, or dusty sand from some of the beaches. Quite literally my time of an optimistic sub 3.40 or at least sub 3.45 was blown away! I came into the final kilometre alongside the 4 hour pacer and was damned if I was going to run over 4 hours so goaded my legs into what felt like a sprint but probably looked like plodding lumbering effort, vaguely heard the cry of Go Harry in what I recognised as my mother’s enthusiastic cheering from the right hand side and pushed for the line. I crossed it according to my watch at 3 hours and 59 minutes, however according to my watch’s Garmin GPS I had also run .3 miles further than necessary! Grrr! French marathons are unique, not only can they not measure them properly, but none of the supporting crowd are, well particularly supportive. This year, I remembered this fact and for the first time ever in a marathon felt the need to succomb to listening to music. I shoved on my iPod from about 8kms from the finish line to distract me from the pain in my leg, the wind and quite frankly onlookers who simply looked on as I longed for the finish and a good old London Marathon 10 deep crowd of noisy name shouting supporters. In general I have nothing against the French, but their lack of support is one thing, but the lack of barriers down the last 500 metres keeping the finally over enthusiastic supporters out of the way is ridiculous. I wouldn’t say I am a particularly pedantic person, but as you come down the home straight after 26miles to have children start running the last few metres with their parent/s or other erstwhile supporters, and the crowd hemming you in so that you can barely run in single file to the finish line where the silly organisers have decided it would pretty to have pot plants leading up to the finish line….makes it the worst finish of any race I have yet encountered. But yet this crazy arrogant French race is so beautiful to run, one keeps coming back for more….and as ever to have my wonderful little support team of Mum & Dad at the finish line in Cannes with a hug and a kiss makes it worthwhile, especially as they always say “darling you looked so good when you went past us!” Even though that was about 100 metres from the finish and I was gritting my teeth for all I was worth. Still, crossing a finish line never diminishes. And there’s always the next one to run faster!